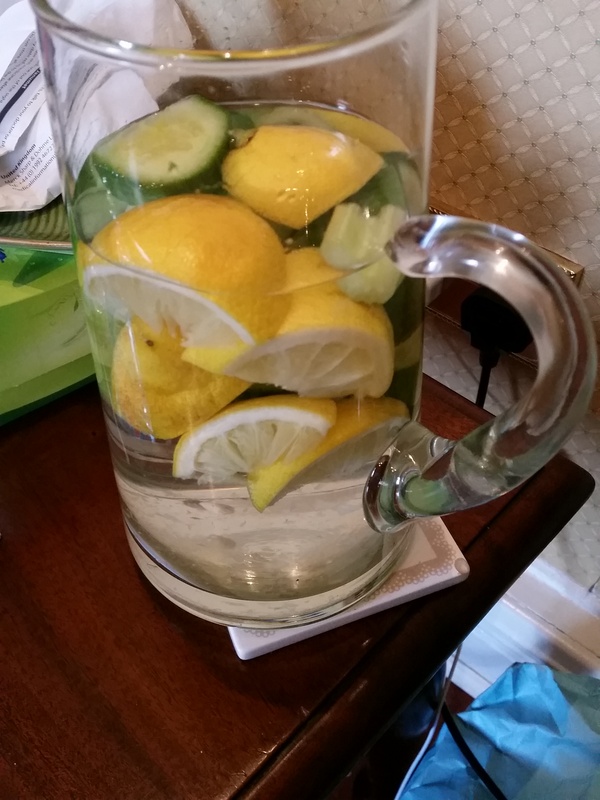 Today I am drinking a jug, or two of infused fruit water. I had a lovely Easter Weekend, but I can honestly say that I ate too much. Too much chocolate (is that such a thing?). Too much dinner, and even for me too much to drink. It is ok to treat yourself once in a while, but I do tend to pay the price with increased pain in my fibromyalgia spots, headaches and a general feeling of blah! Not to mention bloating. Today I am steadily working my way through 2 litres of infused fruit water. My recipe uses a lemon (unwaxed), a good few slices of pineapple (great for arthritis and joint pain), a quarter cucumber (great for flushing out toxins) and a good few handfuls of mint. There are loads of different recipes – I tend to play with how I am feeling and what I have in my fridge. Have a look on Pinterest for some other ideas. It is really easy simply chop and then top up the jug with filtered water if possible. Try and let it infuse for at least an hour or even overnight. I top up the jug and aim to drink two jugs – around 8 glasses throughout the day. It is a good idea to do this on a day when you can stay close to home because you will be running (if you know what I mean?). The one thing I can promise you is that you will feel better for it. Your skin will glow a little and you might even loose a kilo! Another reason for my regular return to fruit water is the medication I take. Although we need medication for some things, it is a bit toxic and there is no harm in flushing your system now and again. Fruit water was one of the first blog posts on my little blog and something I return to on a regular basis. The day is almost done and I am already feeling better. Thanks for reading and let me know if you take up a fruit water challenge. 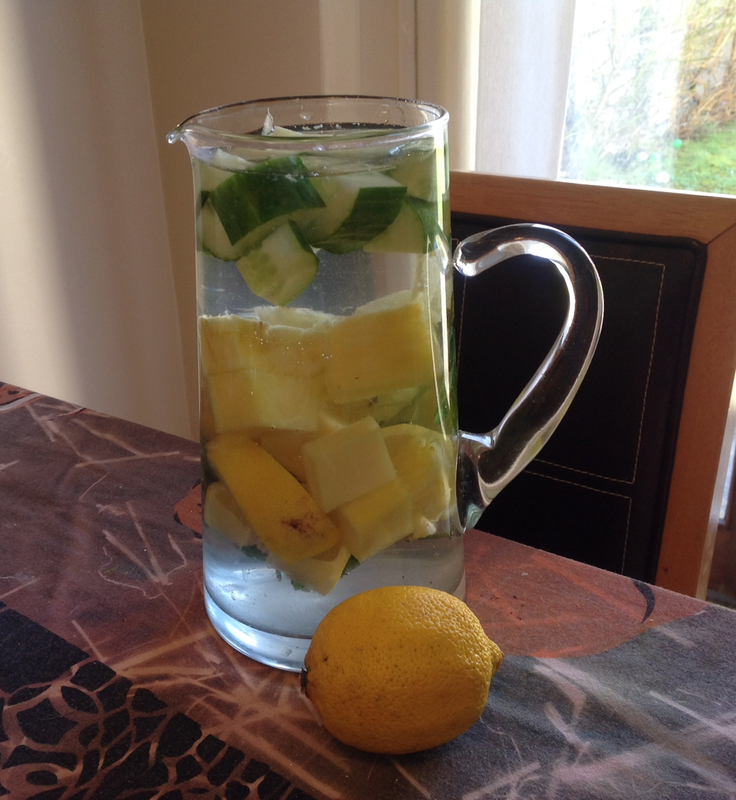 Fruit water – my cure! When I am feeling in need of a bit of a me day, fruit water is my answer. Ideally I make it up the night before, and then leave it steeping overnight and then start drinking in the morning. This batch of fruit water was cucumber, lemon and celery, but I do vary it. My favourite fruit is pineapple, so sometimes I make that the hero. A bunch of mint is another great addition. All citrus is good too. In summer I might add some ice cubes, but I think a cleansing drink is better at room temperature. Throughout the day, I add water and aim to drink at least 2 litres in total. Plan a day when you are staying at home as you will be running …. And in my case that adds in exercise as my bathrooms are a flight of stairs away from my living room. It may be my imagination, but I think my skin glows and I have more energy the next day.